The Seventh Karmapa, Chödrak Gyamtso, was born to a family of tantric practitioners in Treschöd, in Kham, East Tibet. While still in the womb, he was heard to say, ” Ama-la” (mother), and at his birth he declared “AH HUNG!” When he was five months old, Chödrak Gyamtso declared, “There is nothing in the world but voidness!” He then blessed ten thousand people at Arik Thang, where he had once taught during his previous incarnation as the Sixth Karmapa. Astonished by the extraordinary signs that their child manifested, Chödrak Gyamtso’s parents took the nine month-old boy to Karma Gön, where Gyaltsap Rinpoche Paljor Döndrub, was residing. Just as predicted by Thongwa Dönden’s instruction letter, Gyaltsap Rinpoche recognised Chödrak Gyamtso as the Sixth Karmapa’s reincarnation. He was enthroned as the Seventh Karmapa at Garchen Zamling Gyachen, the encampment of the Karmapa. When Chödrak Gyamtso was four years old, he received the entire Kagyu lineage transmissions from Paljor Döndrub. Less than a year later, the young Karmapa brought peace to the warring people who were living along the border of southern Tibet and Bhutan. When he was eight years old, Chödrak Gyamtso began to receive transmissions and instructions from Bengar Jampal Zangpo, who became one of his main Lamas. Jampal Zangpo gave him the monk’s ordination vows, the initiations and practice instructions of Amitayus, Chöd and Mahamudra, and all transmissions that he himself had received from the Sixth Gyalwa Karmapa. Chödrak Gyamtso dedicated much of his life to full and semi-retreat. He was also an exceedingly erudite scholar who composed many works of his own, such as The Lamp of the Three Worlds, which is a commentary on the Abhisamayalamkara. His most famous treatise is a commentary on reasoning and logic entitled, The Ocean of Reasoning. He also established the Karma Dratsang Shedra, Tsurphu Monastery’s monastic university. He restored the large statue of Buddha Shakyamuni that had been commissioned and then, because it was leaning slightly, was miraculously straightened by the Second Karmapa, Karma Pakshi. The Seventh Karmapa established a number of institutions, including the Drebochudo Namgyal Ling Gompa in Powo. He also rebuilt and expanded the Thrangu Monastery in Kham and installed Sherab Gyaltsen (the First Thrangu Rinpoche) as abbot. 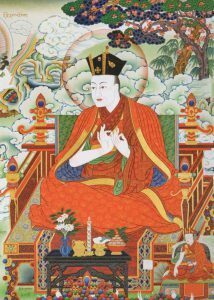 He is known for his many visions of Padmasambhava, which led him to discover hidden valleys, safe havens where people could find refuge in times of war. He settled disputes, worked to protect animals, initiated bridge constructions, and also convinced thousands of people to recite millions of Mani mantras as a universal cure for all ills. He also maintained contact with the remaining Buddhists of India and sent much gold to Bodh Gaya for the Buddha image there to be gilded. The Seventh Gyalwa Karmapa also created the ‘Great Gathering that Adorns the World’: a vast moving encampment of one thousand monks that travelled throughout Tibet. As Erik Pema Kunzang describes in his biography of Tulku Orgyen, this huge ‘moving monastery’ was divided into groups of one hundred monks, with each group camping a day’s travel apart and staying a day in each place. People camped in tiny meditation tents and were all required to keep the Kagyu tradition of four practice sessions a day, even while travelling. Each day they would also recite the Kangyur, the Buddhist canon in one hundred large volumes, with each monk reciting just two or three pages from each volume. The whole encampment was so large that, when everyone was together, the monks could recite the whole Kangyur in just an hour. Having been in retreat for over half of his life, and entered Parinirvana at the age of fifty-two. He had many students, the main ones being Chödrak Yeshe, Shakya Chogden, Karma Trinleypa, Chögyal Tenpa, Sangye Rinchen, Gawang Dragpa, Palden Zangpo, Kyase Togden, Batshog Rangdröl, and Jamyang Tashi Namgyal. However, it was Tashi Paljor, the First Sangye Nyenpa Rinpoche who became his main disciple and who received the sacred transmissions and instructions of the Kagyu lineage. Before passing away, Chödrak Gyamtso entrusted details of his next incarnation to Tashi Paljor.